Ecologix Grit Removal Systems are designed to screen particulate material from a waste stream, to prevent unwanted sediment flowing through chemical and biological treatment equipment. Systems are a durable stainless steel construction for longevity and reliability. Influent flow enters the all stainless steel unit tangentially, creating centrifugal forces that allow water and light weight organics to discharge over an upper weir plate. Grit and heavier materials settle to the lower conical shaped grit zone where they are gently agitated by mixer arms and washed. The unique two-stage organic separation system includes an organic capture cone and organic blowdown valve. 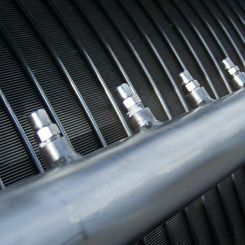 Organics released during agitation and washing are captured in the cone and removed periodically via a blowdown valve.The inclined grit screw provides optimal dewatering. 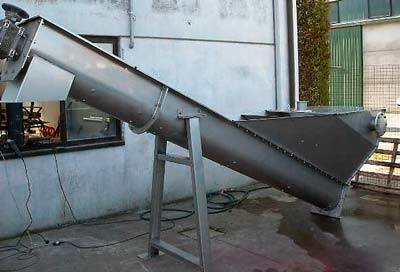 Typical grit discharge from the Grit Washer is 90% dry weight or greater, with less than 5% organic material.